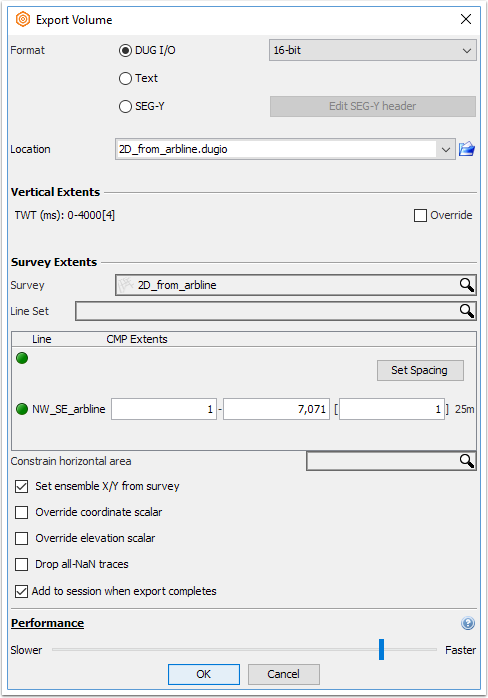 In our example workflow, we’ll take an arbline drawn perpendicular to a fault trend we’re interested in mapping and convert it to a 2D survey. We’ll display the results in 3D for review, and we’ll export the data along the arbline as a 2D volume. Draw a new arbline (or use an arbline already in your session). a. For information on creating an arbline, see Creating an Arbline. b. In the example, an arbline is drawn oblique to the survey geometry so that it is perpendicular to the faults observed on the incoherency slice. c. Multiple arblines can be converted into a single 2D survey if desired. When this is done, each arbline is an individual line within a 2D survey. On the Control Panel, right-click on the arbline and select Export > Convert arbline to 2D line. a. This will create a new 2D survey based on the arbline’s geometry. b. It’s also possible to convert multiple arblines into a 2D survey by pressing Ctrl and clicking on each arbline. Once you’ve selected all the arblines you’d like to convert to 2D, right-click and select Export as described above. c. An advantage to converting the arbline to a 2D line is that it makes it easy to go back and edit fault interpretations made on the arbline, even if the original arbline has been modified. To display the new 2D line in 3D view, tick the traffic light next to ‘Line’ on the navigation panel and select the 2D line from the drop-down menu. In this example, we’ll also turn on the IL/CL sections, and an arbline so that we can easily visualize sections take through multiple structures in different areas. a. You can display multiple 2D lines in 3D view using the Map or 3D view. Press Ctrl and click on each line you would like to display, then right click to choose to display these lines. b. Follow this link to our online manual for more on displaying multiple 2D lines in 3D view: Viewing selected 2D lines in 3D view. On the Control Panel, right-click on the volume and select Export. In the Export Volume window, choose a location to save the volume and enter a name. 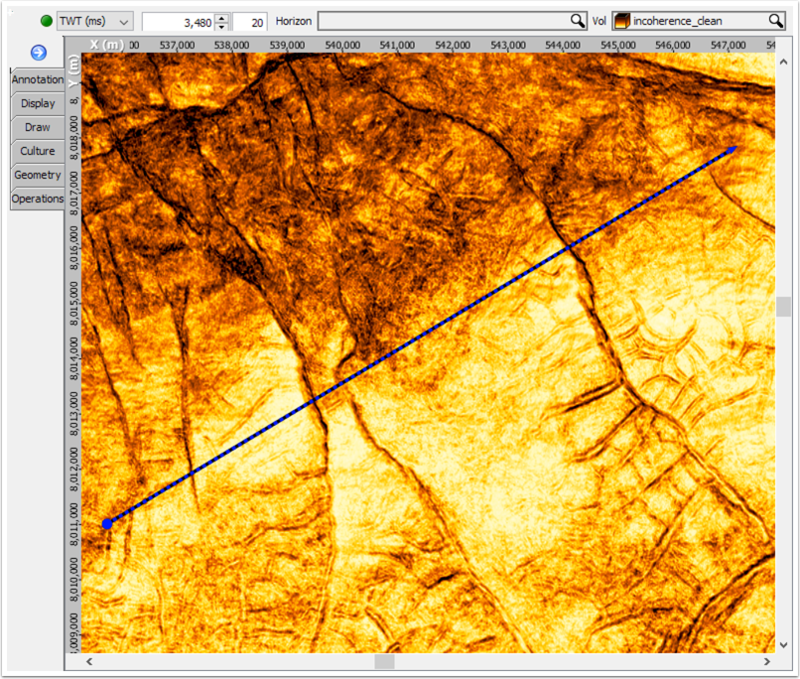 Under Survey Extents, choose the 2D survey created from the arbline. 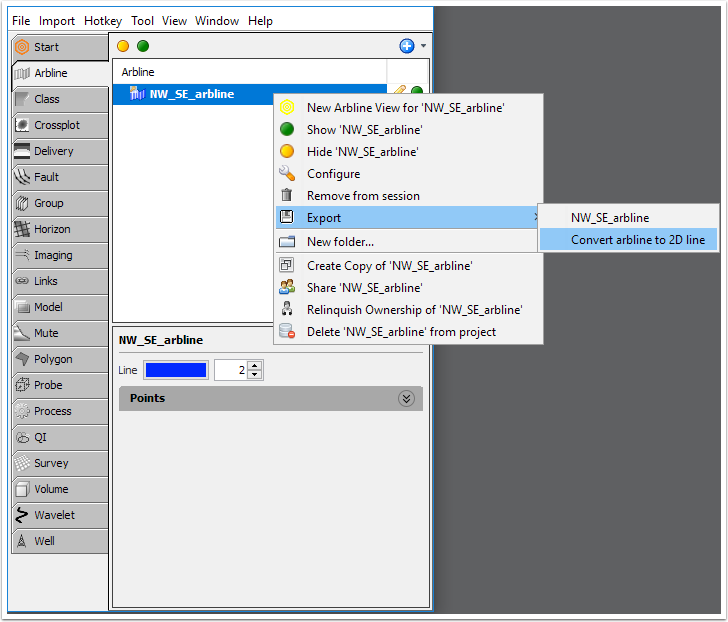 To ensure that the volume is added to your session after export, check the ‘Add to session when export completes’ box. Click OK to export the volume. In areas with high structural complexity, displaying multiple seismic sections is a useful way to give the best view along each structure. 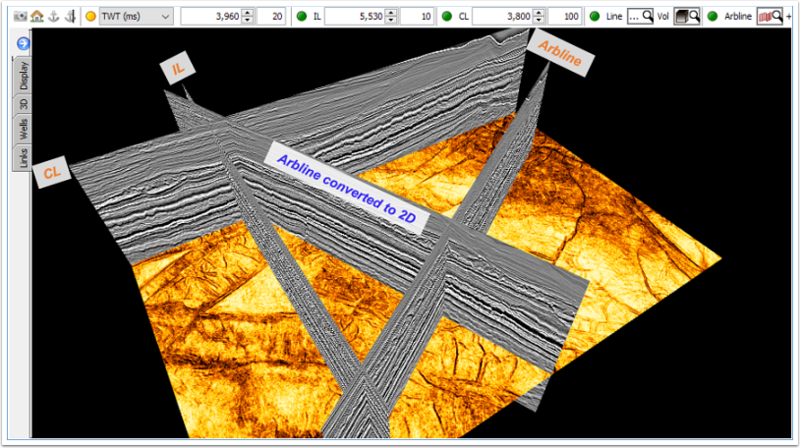 Arblines offer an easy way to create a custom seismic section display, and with the ability to create a 2D line from an arbline, multiple arblines can be displayed as 2D lines in 3D view and can also be exported as new 2D volumes.